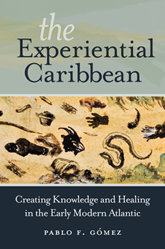 Opening a window on a dynamic realm far beyond imperial courts, anatomical theaters, and learned societies, Pablo F. Gómez examines the strategies that Caribbean people used to create authoritative, experientially based knowledge about the human body and the natural world during the long seventeenth century. Gómez treats the early modern intellectual culture of these mostly black and free Caribbean communities on its own merits and not only as it relates to well-known frameworks for the study of science and medicine. Drawing on an array of governmental and ecclesiastical sources—notably Inquisition records—Gómez highlights more than one hundred black ritual practitioners regarded as masters of healing practices and as social and spiritual leaders. He shows how they developed evidence-based healing principles based on sensorial experience rather than on dogma. He elucidates how they nourished ideas about the universality of human bodies, which contributed to the rise of empirical testing of disease origins and cures. Both colonial authorities and Caribbean people of all conditions viewed this experiential knowledge as powerful and competitive. In some ways, it served to respond to the ills of slavery. Even more crucial, however, it demonstrates how the black Atlantic helped creatively to fashion the early modern world.